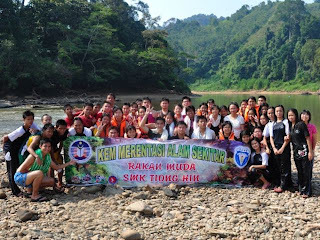 Top Form 5 students & senior teachers from SMB Tiong Hin visited SMK Katibas last weekend. They were very fortunate to arrive at a time when rain was scarce so the water was shallow. Besides getting to ride an express boat & a long boat for the first time, they also had the opportunity of getting off the longboat boat at shallow places to continue on foot until the water gets deeper. Some of them had to push the longboats when it got too shallow. Upon arrival, they were given the Katibas trademark welcome. Who wouldn't feel welcome when every member of the school was lined up to greet you? The principal of SMB Tiong Hin, Stephen Tan, gave the academic staff of SMK Katibas an in-house training on the attitudes of a teacher & he encouraging us to go the extra mile with our students. The students from SMB Tiong Hin spoke to our prefects about their school & how they help run it. 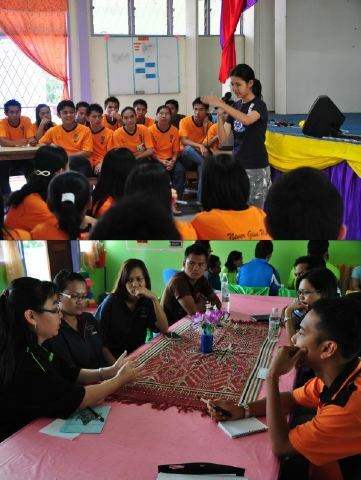 There was also a sharing session between teachers as well as PMR & SPM students from both schools. 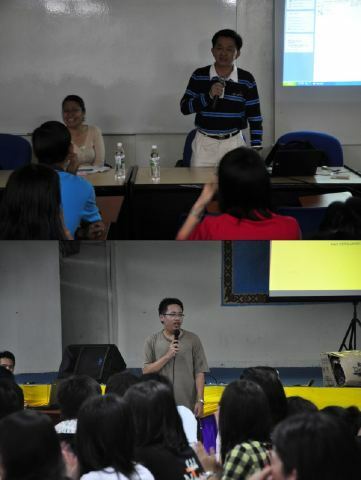 The teachers exchanged tips & techniques for the classroom while students exchanged tips & techniques for the exams! 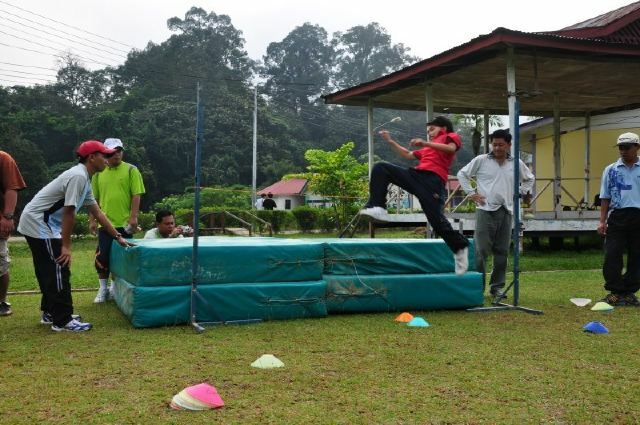 Every morning, the principal of SMB Tiong Hin, being an experienced athletics coach, would coach our coaches on high jumps, hurdles & javelin throws. His expertise helped clear some misconceptions & polish the techniques of our athletes. On Saturday night, we put on a show for them. 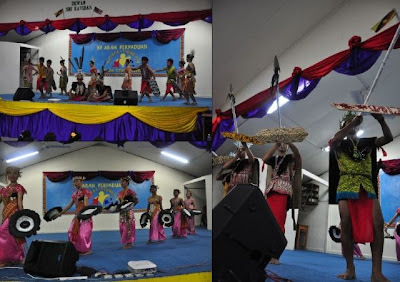 Obviously, there were cultural performances by our dance troupe. They have gone a long way since the first time I saw them at the beginning of this year. This was the best performance I've seen so far. They have managed to go from height to height in polishing their presentation & coordination every time! 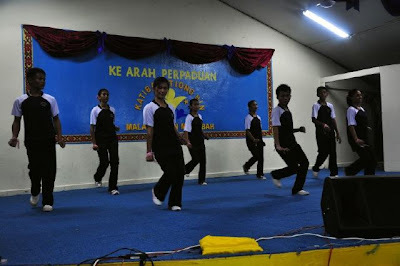 The school aerobics team also performed a really entertaining rendition of the ever so popular Poco-Poco dance. The girls & boys looked so pretty with the make-up on. It's the prettiest I've seen of all of them. Of course, the students from SMB Tiong Hin were not left out. They taught our students several chants & claps, sang a sweet Chinese song & performed a few magic card tricks. They had something different to bring to the table & our students lapped it all up! 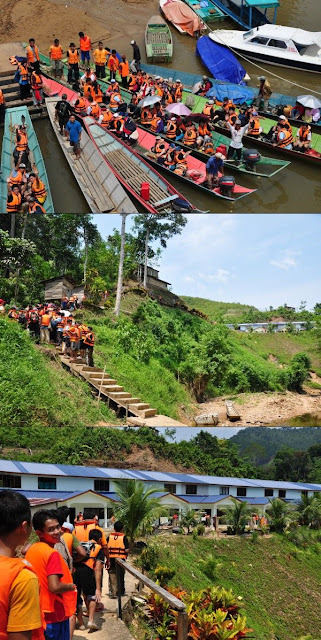 On Saturday morning, our guests were taken for a visit to an actual Iban longhouse. As you can see, the longhouse has recently been reconstructed to incorporate both concrete & wood. I was surprised to see such a modern & neat longhouse. The longhouse isn't the only thing that caught my eye. The natural scenery from the longhouse was just breathtaking. I stood there for hours just taking in the fresh air & greenery. This is Galau the Tuai Rumah (head of the longhouse). He is very friendly, hospitable & responsible. His is always happy when foreigners come to visit. He really made everyone feel at home. Every visitor had to scoop a mixture of egg & clear liquid from one bowl to another. I do not know the significance of this ritual. Anyone care to enlighten me & my readers? Fortunate for us, there were durian trees nearby & durians were in season! Many amongst us were durian fanatics. Not me. You can see it in the way they sucked, licked, scraped & gobbled up all the durians gathered for them. Considering their love for the fruit, there were obviously pictures that were too obscene to be shown on my blog. When everyone had their fill, we set off for a long trek through a virgin forest! It's my first time trekking in a virgin forest. Oh, that 'virgin' word has got such an appeal! 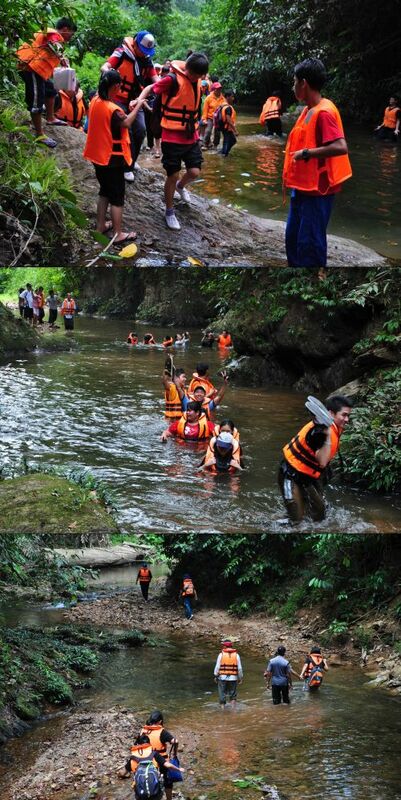 We followed a river & had to constantly wade through water. I did the whole 3 hour trek barefoot! The stones did hurt my feet but I think it's good therapy. We also had to do some climbing & descending. 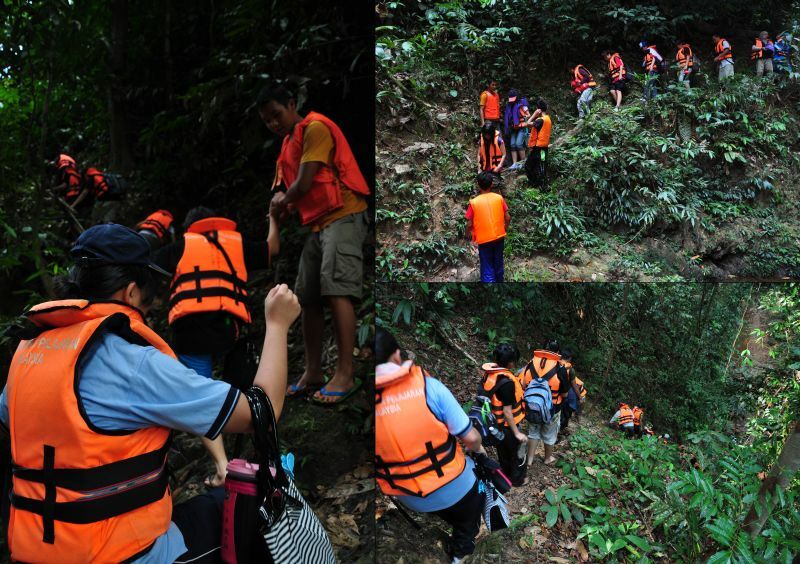 Some were steep, like really really steep, but it was not a problem for the Iban climbers who moved like mountain goats. What was the trek for? Here is your answer. 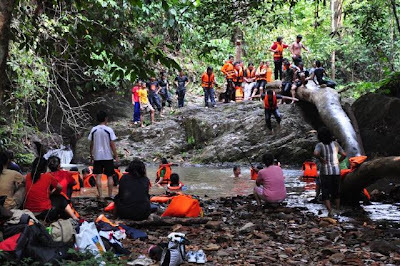 We walked & walked to get to a small waterfall & to have some slurpy wet free-fall fun! It was low tide so the waterfall was reduced to a mini-fall at the left side of the stone wall. It was wonderful. I leaped twice. With a life-jacket on of course... coz I cant swim but still want to play, mah! 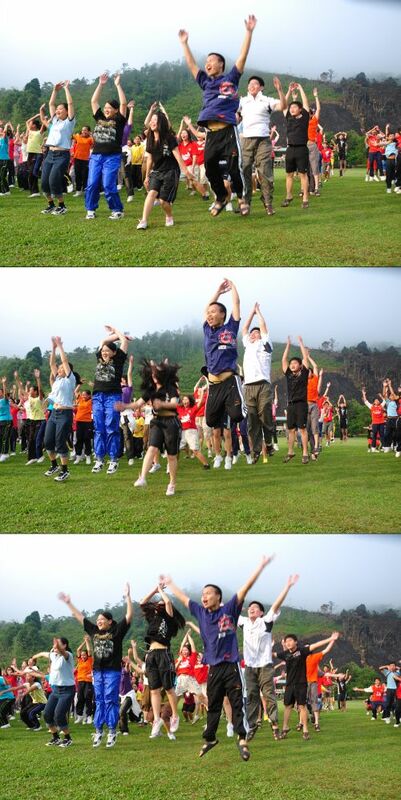 On the final morning, the whole school did some aerobics with our guests from SMB Tiong Hin. 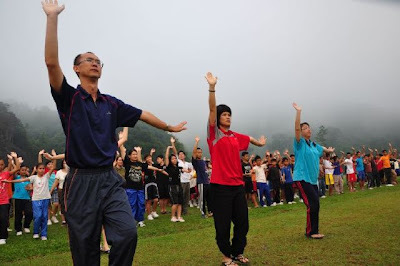 Look at these SMB Tiong Hin teachers. The students from SMB Tiong Hin clearly had a blast! We had our guests jumping for joy! 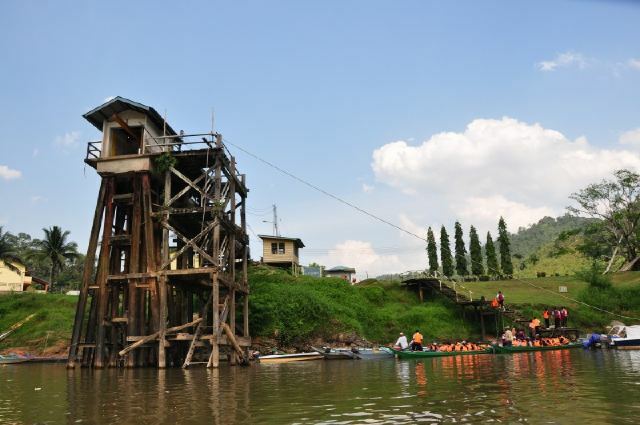 Our school is along the Katibas river & it is a must to have a dip in the river when you visit! There is a perfect spot behind the school where teachers occasionally have picnics & barbecues. The backdrop of greenery & clear skies also make for a sanctified healing place for the troubled urban sole. 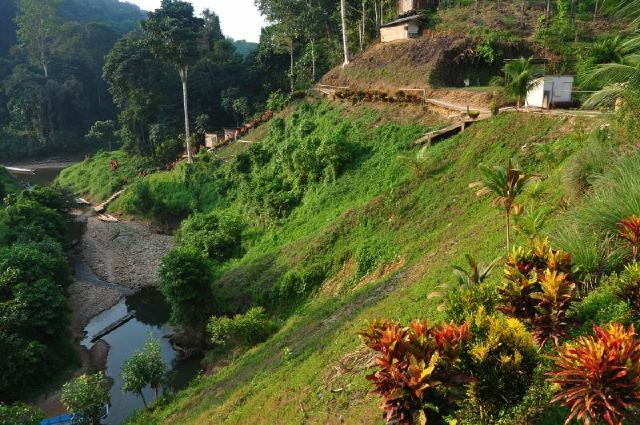 From treasure hunters looking for dinosaur eggs to girlfriends playing group games to the laid-back lazing in the currents to the avid reader looking for a serene reading to the amateur photographer looking to polish his skills. In pursuit of thrills & spills, many of the students (and teachers) attempted the flip. But I think this guy has perfected it. The only reason I put up this picture is because I am in it. After taking photographs of everybody, I finally appear in one of them! From my observations, this visit has achieved its desired effect. Both urban & rural students needed to have their minds & hearts opened up to the infinite possibilities & differences in life. The rural students learned a lot about academics. The urban students learned a lot about heart. Both sides were crying when one had to leave. 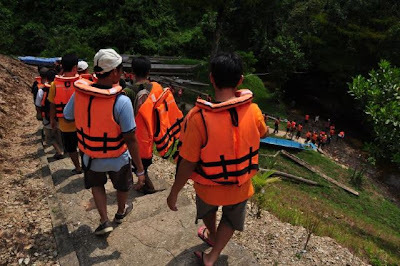 A large majority of our students (without any kind of prompting) escorted & carried the bags of their guests to the boats. The Chinese learned Bahasa Iban. It was heart-warming to see two groups of people from different backgrounds feeling so intimate & concerned for each other. This is true integration. A rare display of unity regardless of race. The children have shown me the way. Any schools or corporate bodies looking for an out of this world experience? Just drop me a comment or email! Our school would be more than happy to have you because it would be just as enriching for us too!